It’s all change around here. It’s been a strange series of spaces for some years now – a lot of it car park, or areas that weren’t quite anything at all, being reclaimed by nature. Since I was last up this way it looks very different, though there are no new buildings to see. The old ones are gone, nearly all cleared, so there are few landmarks, just metre upon metre of this tidy boarding, all along the edges of the roads. On one edge of the site, the old telephone exchange, which it seems is staying in place. A mid-20th century building, and assuming it’s not going to be demolished it will soon be overlooking some early 21st century building. 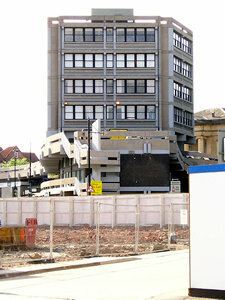 The telephone exchange was previously obscured by some rather drab buildings fronting onto Stonebow. One of them burned down sometime last year and the rest must have been demolished over the winter when I wasn’t looking. Within the Hungate redevelopment area, behind the neat boarding, part of the site is being excavated by York Archaeological Trust. I think it’s this part, with very modern looking walkways constructed amongst the various excavation holes. No one was around here when I visited, pressing my nose up nosily against the steel mesh. I saw something that looked like a bit of old cobbled street, and some holes in the ground, and a lot of debris and soil. If I’d been organised enough to come when the site was open, I could have told you more. 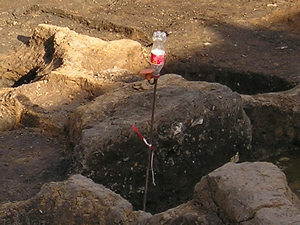 Here, a point of interest in this study of the remains of previous centuries is marked with a 21st century empty coke bottle. For more information on the dig here, see www.dighungate.com. At the edge of the cleared spaces are some smaller areas still in use. The brick walls of what was once a building remain, though the roof has gone and the windows and doors are bricked up. 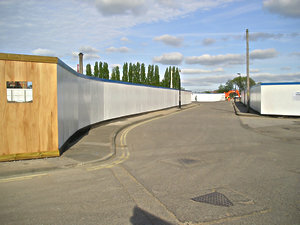 The walls remain to provide something very valuable in York – a protected car parking area. 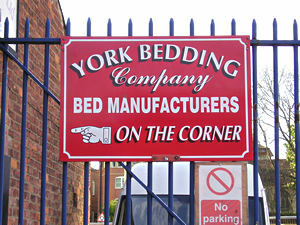 The rather handsome sign of the York Bedding Company. This small local business hangs on in there, while the Hungate area is cleared around it. It appears that the council are to use a Compulsory Purchase Order to force this business to sell and move. 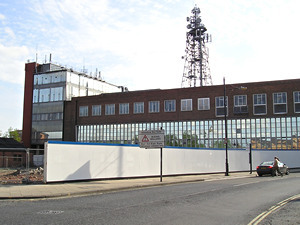 The clearance of much of this area has resulted in an enhanced – if that’s the word – view of the Stonebow building. 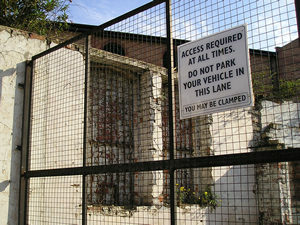 This area was visited in 2004 – see York Walks /1 – Ripe for redevelopment. Also in June 2006 and in 2010. 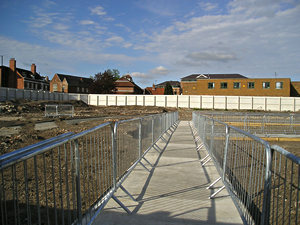 The City of York Council website has more information on the Hungate development area. The local Press website includes a story on the CPO plans re the York Bedding Company. See this page for updates from this area in 2010.